The new plan places paddling on equal footing with other Park activities by managing visitor numbers similarly (the percentage of visitors who boat is estimated to be under 5 percent, which is comparable to the park’s climber and backpacker use). The plan considers river segments as “water trails” or backcountry routes, opening new segments to boating for the first time. While the traditional three-mile, calmwater “pool-toy” and raft-rental stretch in the heart of the valley remains unchanged user-wise, which takes floaters from the horse corrals by Stonemen Bridge/Lower River Campground to Sentinel Beach, now an additional 45 private boaters per day will be able to run the river through the entire length of Yosemite Valley, a section that was closed before. He recommends making the trip before Memorial Day to avoid crowds, and says that they’re still working out the details of permit allocations, which will likely be a combination of online and onsite sign-up options. “And bring a bike and ride your shuttle to avoid the extra car fee inside the park,” he says. While much harder in difficulty, the plan also opens up additional kayaking options that are still in the Park, but outside of the Valley. Daily use limits will range between 10 people per day through the Class V+ Merced Gorge, and 50 people per day on the Class IV+ section from El Portal to the Park boundary. “The gorge section isn’t for everyone,” he says. 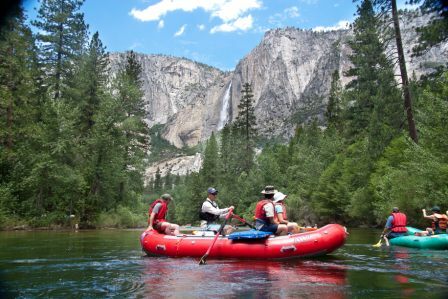 “It starts out as Class V+, and then it gets hard.” Additionally, the multi-day, self-support, Class V South Merced is now also officially regulated, with user capacities set on 25 people per day, as is the multi-day pack-raft section above Nevada Falls. Park officials expect that the river’s hydrology will play a hand in managing boating use. With boatable flows rarely extending through July; the park expects most people will boat between March and May. To paddle in the Park, boaters will be required to have boats that are in good condition and designed to handle the class of whitewater on that reach. Running reaches Class II and above will require additional safety and self-rescue equipment. Boaters will also be required to use established put-in and take-out locations, and to avoid sensitive riparian vegetation. As part of the park’s natural ecosystem, large woody debris in the river will remain in place.